There is no toy box like our Lil Leprechaun Toy Box! In bright ND Blue and ND Gold, emblazoned with the interlocking ND and the Leprechaun this is "One of a Kind. With a child-safe safety hinge and water based, nontoxic and fully tested finishes, the Lil Leprechaun Toy Box is a must for any child's room or play room. This handcrafted treasure starts with the highest quality Baltic birch veneer, hand sanded to ensure smooth, child-safe edges. The top, trimmed in hard maple, highlights the interlocking ND while the front, with an inlaid ND Leprechaun, leaves no doubt whose "House" this is. The generous sizing makes this perfect for holding everything from trains, footballs and teddy bears to a pot of gold. Ships fully assembled. We rarely have these in inventory. These are made to order. Please allow 4 weeks for delivery. *PERSONALIZE Your Lil Leprechaun Toy Box Maximum of 25 characters including spaces! If you have a name or phrase longer than 25 characters contact us through Etsy email and we will see what we can do! It doesn't hurt to ask! *Please use the Notes Section on the checkout page to specify what you would like your personal painting to say. *Please allow an additional 1 to 3 business days to complete your personalization. The name, logo or indicia featured in this product are protected trademarks of University of Notre Dame. Our finishes are water-based, kid safe, and fully tested. Handcrafted in South Bend, Indiana. These are made to order. Please allow 4 weeks for delivery. 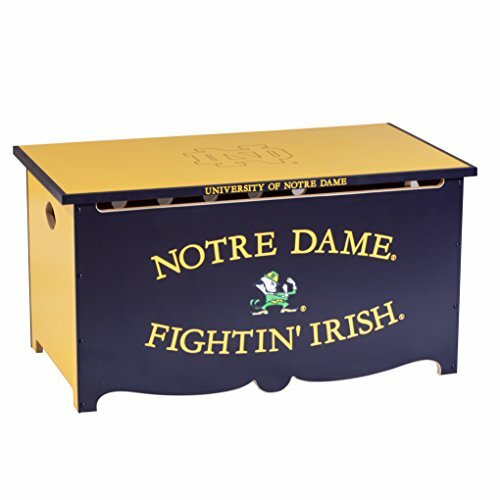 PERSONALIZE Your Lil Leprechaun Toy Box! Proudly handcrafted in South Bend, Indiana. If you have any questions about this product by South Bend Woodworks, contact us by completing and submitting the form below. If you are looking for a specif part number, please include it with your message.